This week's "Fabulous Room" is a lovely bedroom designed by Alison Hersel. 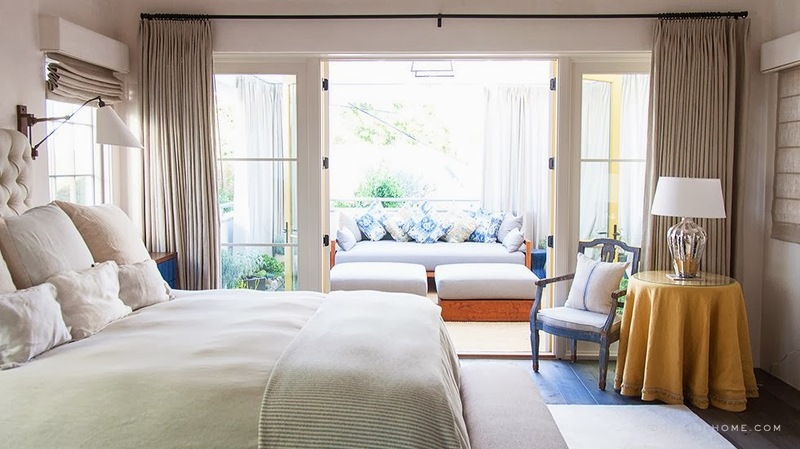 Located in Los Angeles' tony Pacific Palisades neighborhood, the house is luxurious, but with the signature, laid-back attitude California is famous for. I love this bedroom because it is flooded with light, marries indoors with the outdoors thanks to the dreamy sitting room, and blends masculine and feminine pieces so beautifully. A tufted ivory bed, Louis XVI bench, and skirted table look fantastic next to the clean-lined, bright blue nightstands, utilitarian swing arm lamps, and abstract art. The mix works and it works rather well. I love the calm color palette. Almost everything is done in neutrals which really sets the stage for the color accents to truly pop and tie everything together. I know I've said this before, but there is such a special quality to the light in California. It's just different than it is anywhere else-- just ask a photographer or designer. I dream of living in California someday and enjoying its beautiful light everyday, but until then, I am looking forward to our trip to San Francisco and Napa next week. I'll be packing this weekend and tying up loose ends to make sure that everything is in place before our trip so that I can hopefully (try to) relax for a few days. Have a wonderful weekend! This is such a beautiful and comfortable room! Have fun in Northern California next week--I've been to San Francisco before and it is just a wonderful place. You'll have a great time. The blue night stands adds a special cheefulness to the room. Great way to start the day! This is a great room. Cozy and a bit like a luxury hotel room with the adjoining outdoor space. I could easily settle up in here. Pretty room! Hope you enjoy San Francisco. It's raining here today...but we need the water.